By Michael D. Stutman, Esq. Are You Getting a Divorce in New York? Fortunately, attorney Michael Stutman understands your need to know. During his thirty years of practicing law, he has helped hundreds of individuals navigate the maze of divorce. 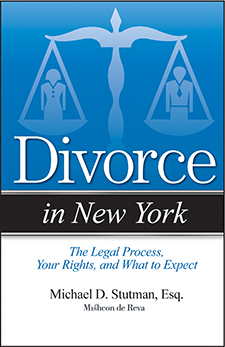 In Divorce in New York he answers not only the questions on your mind but also those you may not have thought to ask. What is the mediation process and does New York require that my spouse and I go through it? How quickly can I get a divorce in New York? What actions of mine might influence my receiving custody of the children?